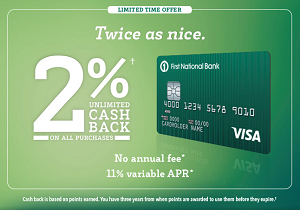 For a limited time, First National Bank of Omaha is offering its BucksBack Visa Card with an unlimited 2% cash back on all purchases with no annual fee and a low 11% variable APR. You must, however, apply by December 31, 2015 to receive this offer. Also, FNBO is currently only accepting applications from Colorado, Illinois, Iowa, Kansas, Nebraska, South Dakota, and Texas. The FNBO Platinum Edition Visa offers 0% APR on purchases for the first 15 billing cycles after your account is opened with no annual fee. The 0% intro rate does not apply to balance transfers or cash advances. Since the card doesn’t earn any rewards and balance transfers carry a 3% fee with no cap and a $10 min, the primary attraction for this card is its lengthy 0% intro period on purchases. Since FNBO is also known to give rather generous credit lines, the card could also potentially help burnish your credit score. The card itself has a reward program called Maximum RewardsSM where you earn 1 point for every $1 you spend. The points are redeemable for cash, travel, gift cards, merchandise, etc. Apply online at www.firstnational.com/apply and use access code 60358. I was able to enter a random 8-digit number for the reservation number and was still presented with the application. Call 1-800-734-5944 and mention code 60358. The deadline to apply for this offer is June 21, 2007.